A driver shortage affected the quality of the driver pool with more young, inexperienced drivers operating trucks. Vehicle utilization levels increased due to an improved economy and lower gas prices. Greater availability of safety data on motor carriers has led to attorneys use of this information to target commercial auto cases and win them. Attorneys are succeeding in shifting responsibility from the person behind the wheel to the employer and winning large “nuclear verdicts” of over $10 million. Increase in traumatic brain injury (TBI) cases. if an attorney can find an expert to allege a TBI, verdicts can be driven to higher levels. The “super experts” are winning TBI arguments in front of today’s jurors. Some of these trends are the same ones affecting personal auto lines. The author warns that claims departments need to be prepared and proactive. Will your baby need to learn to drive? “They’ll be driving soon,” a friend said recently when I sent him a photo of my two young sons. “Hoping car will do that,” I responded, only half-joking. But if you think about it, we may not be so far from that scenario and insurers are among those saying sooner, rather than later for self-driving cars. Axa UK’s chief executive Amanda Blanc told The Telegraph that autonomous vehicles could be on the roads within 15 years. In preparation Ms. Blanc said it is crucial for the insurance industry to build a framework for what happens in the event of a car accident that is caused by a computer, rather than a human. “Driverless cars will not be able to take to the roads [without that],” she added. Insurers know that new technology, particularly the rise of autonomous driving, will drive a big shift in liability claims and they are preparing accordingly. For example, in our earlier post we reported that Allianz has already started building teams of engineers with experience in automotive and driverless technology. The Trump administration is set to unveil revised self-driving guidelines within months, according to this Reuters report. 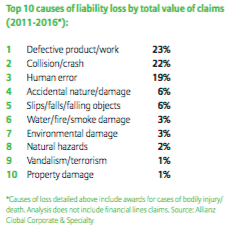 Despite advances in safety, the impact of collision/crash, particularly motor-related, is the main driver of liability loss activity in the United States, according to Allianz’s latest global claims review. Check out the I.I.I. issues update Self-Driving Cars and Insurance. Businesses saw a 5 percent decline in the total cost of risk (TCOR) in 2016—the third year in a row that corporates have benefited from lower prices, according to the latest RIMS benchmark survey. The study defines TCOR as the cost of insurance, plus the costs of the losses that are retained and the administrative costs of the risk management department. CFO.com has more on the findings. 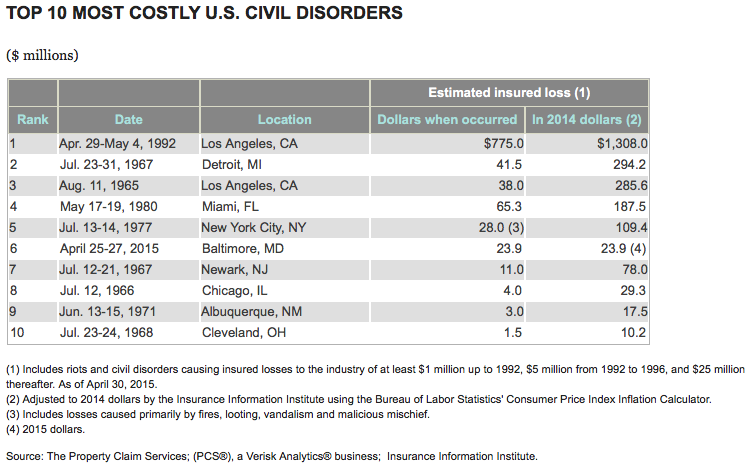 Impact Of Collision/Crash Top Cause of Liability Loss In U.S. Despite advances in safety, the impact of collision/crash, particularly motor-related, is the main driver of liability loss activity in the United States. 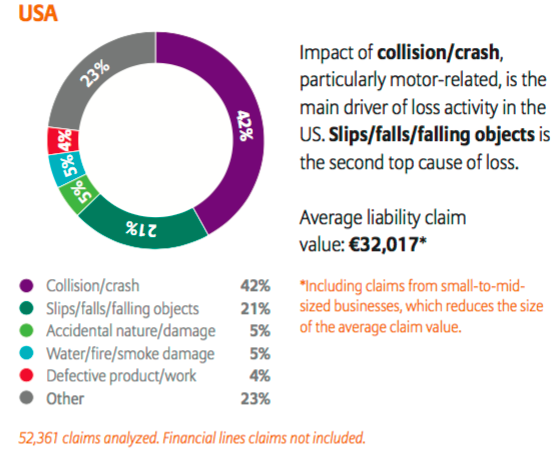 The impact of collision/crash accounted for close to half (42 percent) of the value of business liability claims in the U.S., according to the latest global claims review by Allianz Global Corporate & Specialty (AGCS). The shift to product liability will require insurers to develop technical expertise and not rely on historic data and driver profiling for pricing. Allianz has already started building teams of engineers with experience in automotive and driverless technology. AGCS Global Claims Review analyzes over 100,000 corporate liability insurance claims from more than 100 countries, with a total value of €8.85bn (US$9.3bn), paid by AGCS, and other insurers, between 2011 and 2016. See Insurance Information Institute (I.I.I.) information on litigiousness here. In true holiday spirit we just got our kids to the mall to see Santa this week. Its an annual tradition, a visit that helps keep the magic alive in our all-too-knowing six and four-year olds’ minds and more importantly yields the holiday photo that keeps on giving throughout the years. Luckily, the letter from the North Pole had arrived a few days earlier telling him he had made the Nice List and that Santa knew from our elf Chippy just what he was wishing for. But what if the conversation had gone a different way? Sometimes magic confronts reality and a lawsuit ensues, reminding us what’s at stake for Santa and the mall this Christmas. In the post, Court Holds a Mail Santa Liable: Damages Owed For Failure To Deliver A Toy Fire Truck, Randy Spencer – the only stand-up comic to specialize in insurance – tells of a Montana trial court that found a mall and its Santa liable for a child’s emotional injuries after promising a toy that was not left under the tree come Christmas Day. How much damages did the court award in this case? $95,000. All of which is a timely reminder that Santa (and the malls that embrace the Christmas spirit) need insurance too. Which is why the Insurance Information Institute (I.I.I.) urges St. Nick to review his insurance policies to be sure he’s got the right insurance coverage with its Santa’s Insurance Wish List. And we suggest the I.I.I.’s business insurance checklist would make a great stocking stuffer in this case. All the best for a happy and safe holiday season! The massive global distributed denial of service attack (DDoS) against internet infrastructure provider Dyn DNS Co. that left over 1,000 major brand name sites including Twitter, Netflix, PayPal and Spotify, inaccessible Friday has implications for insurers too. As Bryan Krebs’ KrebsOnSecurity blog first reported, the attack was launched with the help of hacked Internet of Things (IoT) connected devices such as CCTV video cameras and digital video recorders (DVRs) that were infected with software (in this case the Mirai botnet) that then flooded Dyn servers with junk traffic. 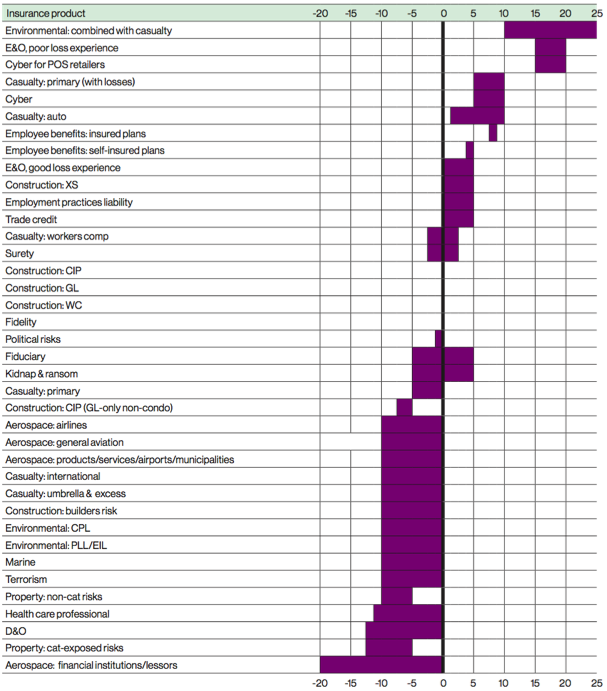 The World Economic Forum (WEF) recently warned that failing to understand and address risks related to technology, primarily the systemic cascading effects of cyber risks or the breakdown of critical information infrastructure could have far-reaching consequences for national economics, economic sectors, and global enterprises. As the IoT leads to more connections between people and machines, cyber dependency will increase, raising the odds of a cyberattack with potential cascading effects across the cyber ecosystem, the WEF noted. While IoT connected devices have the potential to transform how businesses and individuals—and their insurers—conduct, manage and monitor their operations, workplaces and their homes, clearly there are embedded risks that insurers need to consider. Over at Celent’s insurance blog, Donald Light, director of Celent’s North America property/casualty practice, says the Dyn DDoS attack has a number of potentially serious implications for insurers. If the same type of safety and security devices are disabled by malware, homeowners and property insurers may have increased and unanticipated losses, Light suggests. The Insurance Information Institute white paper on cyber threats and opportunities is available here. As the mother of a young child with a life-threatening nut and sesame allergy, it’s hard to remain objective and impartial when it comes to a company increasing the price of EpiPen, the life-saving allergy injector, by more than 400 percent since 2007. However, the latest example of a company facing a public backlash, political pressure and social media storm due to its business practices illustrates the importance of having the necessary resources in place to mitigate the effects of a reputational risk crisis if and when it occurs. As we’ve noted before in an earlier blog post, reputational risk is among the most challenging categories of risk to manage. A survey from ACE Group found that 81 percent of companies view reputation as their most significant asset—and most of them admit that they struggle to protect it. The survey suggests that organizations need a clear framework for managing reputational risk that reduces the potential for crises, taking a multi-disciplinary approach that involves the CEO, PR specialists and other business leaders. Mylan, the company at the center of the EpiPen controversy, has moved quickly to respond to the angry mob and to stem the drop in its share price which has so far lost investors $3 billion. Yesterday, Mylan’s CEO Heather Bresch went on CNBC to announce the company was increasing financial assistance to patients to offset out-of-pocket costs of the EpiPen. However, as The New York Times reports, Mylan did not say it would lower the list price — which has risen to about $600 for a pack of two EpiPens, from about $100 when Mylan acquired the product in 2007. By the way, actress Sarah Jessica Parker also announced she is ending her relationship with Mylan after the pricing debacle broke. Wherever you stand in this debate, the reality is the pharmaceutical industry is for-profit, as noted by Ms Bresch, and in the absence of a competitor or a generic, EpiPen is the latest example of a company trying to maximize profit. Reputational risk is not covered by a standard business insurance policy, but companies can purchase coverage via a stand-alone policy which typically would pay fees for professional crisis management and communications services; media spending and production costs; some legal fees; other crisis response and campaign costs including research, events, social media and directly associated costs. Newer reputation insurance products have also been developed that would cover a company’s financial losses due to reputational and brand damages. In the mean time, in a climate of increased public, regulatory and investor scrutiny, the Mylan case is a good example of why companies need to be more proactive than ever to respond to challenges before they do serious damage to their brand and reputation.